#For all Discipline in general - UG, PG and Ph.D. should be in the respective disciplines of Engineering, Technology, Architecture/Town Planning, Science, Humanities and Management Studies. #For the Discipline of Engineering/ Technology/ Architecture - First class both at UG and PG level (60% or 6.5/10 CGPA) from the recognized University/ Institute and Ph.D is desirable. #For the Discipline of Science/ Humanities/ Computer Applications/ Management Studies First class both at UG and PG level (60% or 6.5/ 10 CGPA) from the recognized University/ Institute and Ph. D in the respective discipline. #For the Discipline of Science/ Humanities/ Computer Applications/ Management Studies. If candidates with Ph.D are not available, candidates with First Class M.Phil. for the discipline of Science/ Humanities/ Computer related topics/ Management studies in addition to I Class in UG&PG level will be considered for Temporary Faculty (Part Time) position. Selection process for NIT Trichy Recruitment is based on performance in Written Test and Interview. #For these without Ph.D. in Science/ Humanities/ Management Studies and others: Rs. 25,000/- per month for Temporary Faculty (Part Time). Eligible Candidates apply in the prescribed application format. The hard copy of the filled in application form in the prescribed format along with required enclosures has to be sent to The Dean (Faculty Welfare), National Institute of Technology, Tiruchirappalli - 620015. Tamil Nadu, by Speed / Registered post on or before 22/05/2017. Tags: NIT Trichy Recruitment 2017, NIT Trichy 148 Teaching Faculty Posts Apply online, NIT Trichy Job Vacancy 2017 For 148 Teaching Faculty Posts. National Institute of Technology Job Vacancies 2017. 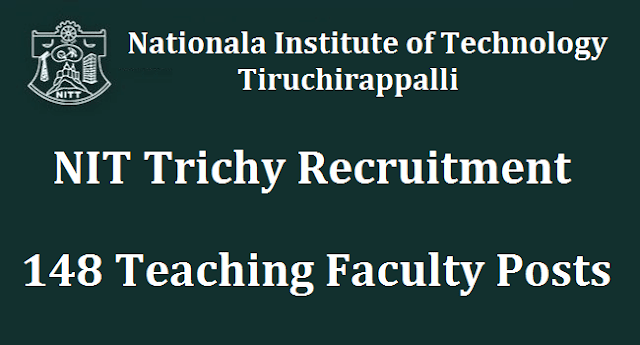 NIT Trichy Released Job Openings Notification 2017,National Institute of Technology Recruitment 148 Teaching Posts 2017.